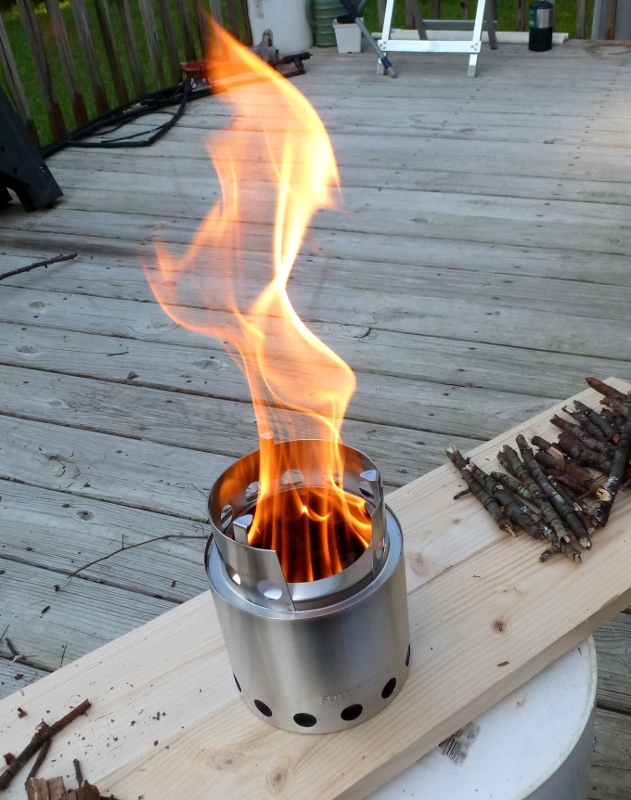 I bought the Solo Stove because I thought it would be a wonderful little pyrotechnic toy to play with. After cooking dinner with it this evening, I am amazed at what a serious piece of quality gear it is. Since it’s double walled, embers from the fire grate do not touch the surface beneath it, so it is safe to use on wood tables or on the ground. It truly leaves no trace! 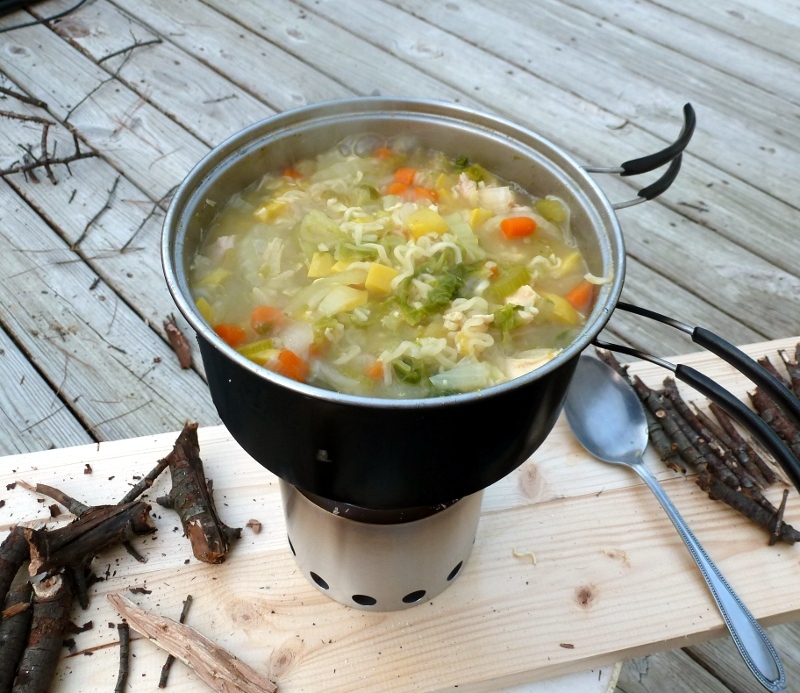 Anytime you cook directly over a fire, your pots get soot covered. I initially covered mine with aluminum foil to prevent that. But after tipping a pot, I realized that the foil made the pots more likely to slide around, so I removed it and will just deal with cleaning up the soot. My purpose in cooking with the stove this evening was to practice survival cooking — the kind you would do after a natural disaster when you didn’t have access to your kitchen. 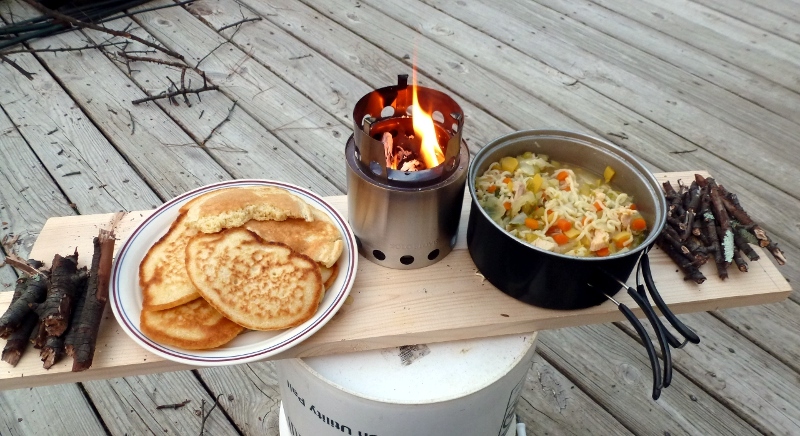 I wanted a stove that was small, simple, and that wouldn’t require having to buy extra fuel if the emergency continued for several days…. or weeks… like the power outages after a hurricane. I also wanted to experiment with cheap, easy storage food. And what’s cheaper and easier than Ramen? But no way could it be considered nutritious. So my project was to concoct a nutritious meal using Ramen as a base. I added onion, celery, carrots, squash and, after they started getting tender, shredded napa cabbage for additional flavor. Almost any veggie combination would work. 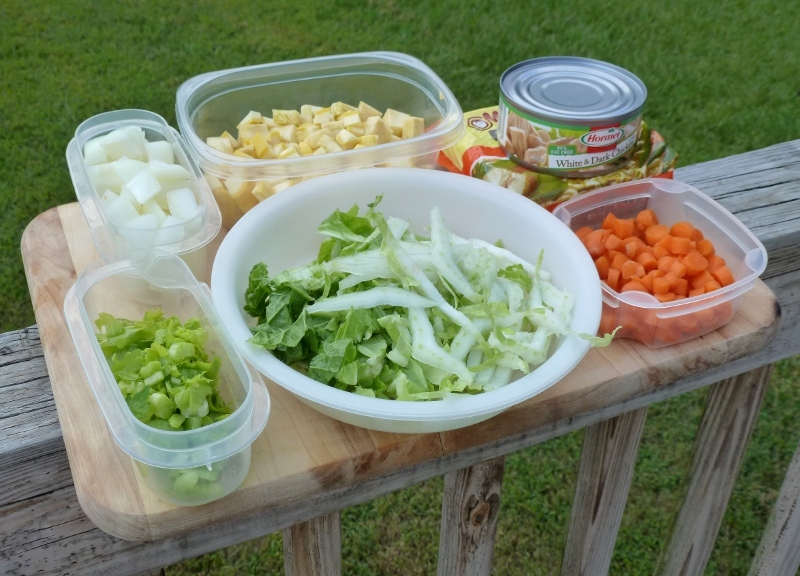 And the veggies could be fresh, frozen or dehydrated. Since I added so many vegetables, I was afraid the Ramen flavor packet would not be enough to season everything, so I added an extra rounded teaspoon of bouillon. When the vegetables were tender, I stirred in a small can of chicken, and added half a package of crushed Ramen noodles. Finally I stirred in the flavor packet and boiled the soup one more minute. It turned our surprisingly good–a flavorful, chunky, satisfying soup. 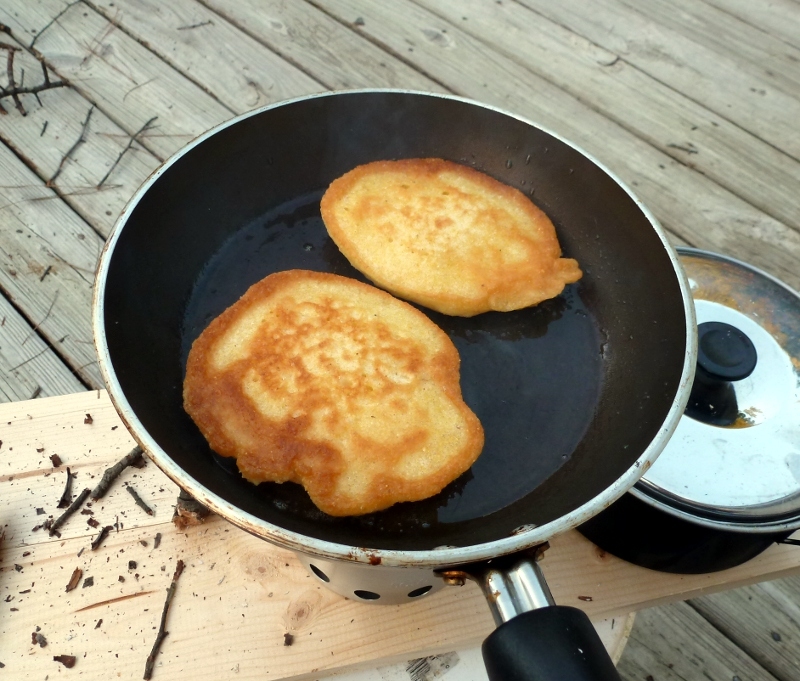 I also wanted to experiment with pan bread, and the little Solo Stove proved to be a champ at cooking fried corn bread. I did have to watch the pan carefully because the large handle made the pan unbalanced and it would have tipped easily. But with a little care, it worked well. temperature best. I was scoring the branches with the saw on my Swiss Army Knife, then breaking them, when Ron got out the pruning loppers and rapidly turned the rest of the branch into perfect chunks. 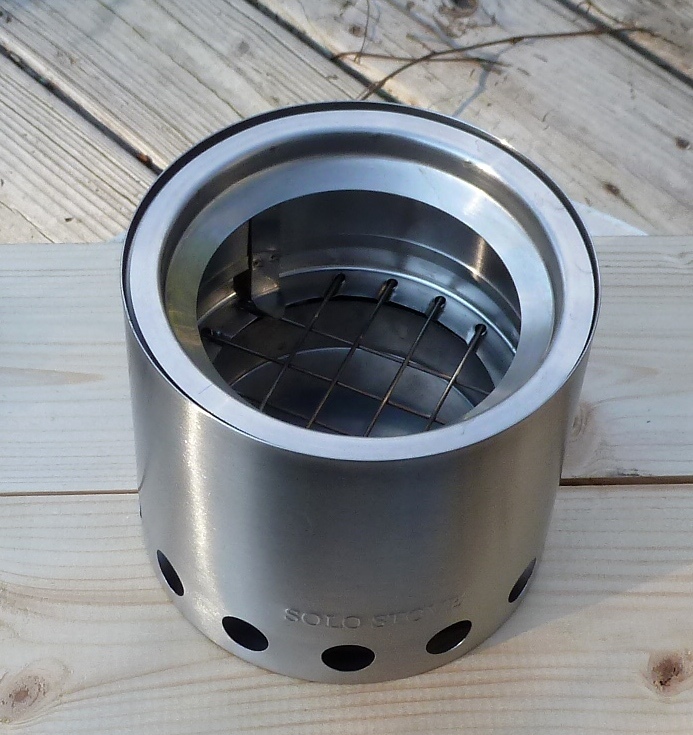 I very highly recommend the Solo Stove as an essential piece of emergency gear. If you get it, remember not to use sticks you find on the ground if you have any other option. Hanging deadwood is drier and if you are anywhere near the woods, you will find it everywhere. You can use damp wood once you get a hot starter fire going, but it will not burn as cleanly or efficiently. And one final tip — the fastest way to smother and mess up a good fire is to try to feed it too much too fast. 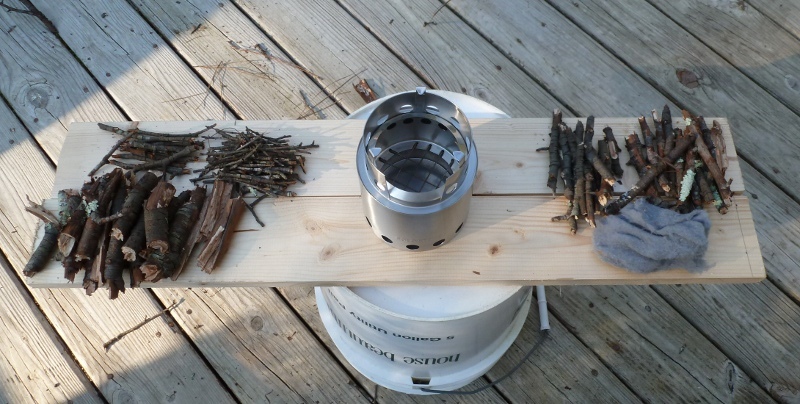 Wait until the fire in your Solo Stove starts to die down before adding two or three more sticks at a time. My new favorite toy/best gear! Thanks so much for this extensive review. I keep hearing good things about this stove. We rent camping equipment nationwide at our shop and may bring it on as a rental item. If you wipe a thin coat of dish soap on the outside of your pot before cooking the soot will come right off. If you like this kind of stove you should check this one out. You can also charge your cell phone with it. Not only that it comes with a grill accessory. They say there is a lot less soot problem with it also.